HIGH END PRINTER AT LOW COST. ENTRY LEVEL JUST GOT REDEFINED. 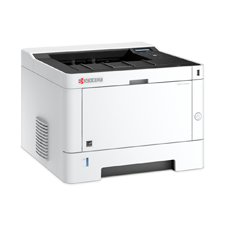 If you’re looking for a fast, reliable and versatile A4 b/w office printer, you really can’t go wrong with any model from our new ECOSYS series. But for all those who demand that little extra greatness, we present the P2040 devices. They sport a very short time to first print and an enhanced print speed of up to 40 pages per minute. It benefits your workflow with many features, such as standard duplex and network functionality, a high paper capacity and standard Wi-Fi for the P2040dw. The total cost of ownership is very low thanks to long-life, energy-efficient components. And as to expect from any KYOCERA device, they are extremely reliable, so you can stay productive at any time. Applicable OS All current Windows operating systems, Mac OS X Version 10.5 or higher, UNIX, LINUX, as well as other operating systems on request.